Welcome to our exciting school website. 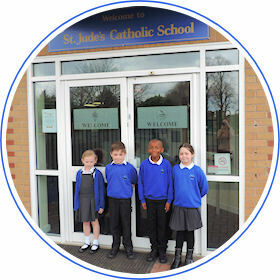 All the children and staff at St Jude's would like to wish you a very warm welcome. We hope our website gives you an entertaining and informative insight into our school. Please look round by clicking the links on the left or at the bottom of the page. Our website is easy to navigate, so you won't get lost! Keep your eye on our Newsletters and Diary pages which will bring you up-to-date with school events and all those important dates for your diaries. We are a family-friendly school and we always enjoy hearing from visitors and friends, so please leave a message in our Guestbook, or get in touch by one of the ways listed on the Contact Us page. 07 Apr 19: School newsletter and diary dates. 31 Mar 19: School newsletter and diary dates. 24 Mar 19: School newsletter and diary dates. 17 Mar 19: Dan Callow conducted our Lenten Retreat Day called A Heart That Sees. 14 Mar 19: School newsletter and diary dates. 14 Mar 19: Some updated school Policy documents. 14 Mar 19: We all dressed as our favourite characters for World Book Day. 14 Mar 19: Two new photos depicting our Cookery sessions.